During the two last years this pain became continual, accompanied with convulsions, often depriving her of both her reason and rest. She was two or three times brought to death’s door by it. At the end of four years, after trying several medicines to no purpose, and despairing of any relief, and yet not knowing what to do, she took to taking rapee-snuff. Rapé is the Spanish name for snuff. Today the word is also used to denote a medicinal herbal concoction used by certain indigenous tribes of South America – but in this case the snuff was probably just powdered tobacco. She had not taken this snuff for a month, when behold seized one morning with a fit of sneezing, and blowing her nose after, to her great surprize she sound a worm rolled up in a little blood. Not the sort of surprise one particularly appreciates. 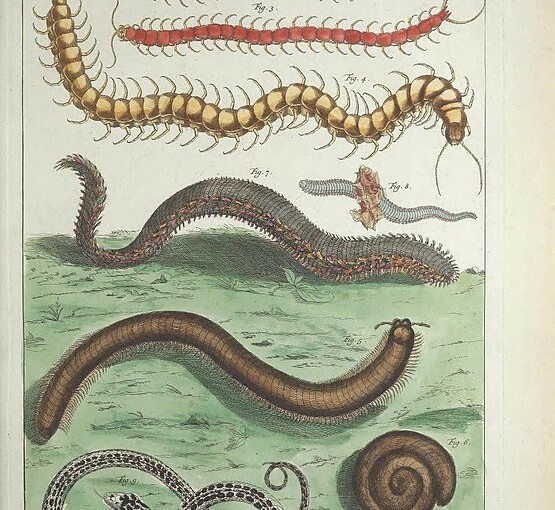 This worm when stretched to its full length, was six inches long, and but two when it contracted itself. It was two lines broad, and one and a half thick, of a coffee-colour, convex on one side, and flat on the other. It was of the centipede kind, had fifty-six feet on each side. It had two eyes, and both its head and tail were armed with two forks. It lived eighteen hours in an empty bottle, and three or four hours after brandy had been put to it. The egg that produced this worm in all probability was sucked in along with the air she breathed, and carried after to the frontal sinus, where it met with a proper nidus, to give it both growth and increase. A ‘nidus’ is a place where an insect lays its eggs, or its nest. M. Littre, who related this history, advises in all such stubborn cases as will not submit to either external or internal means, to come to the trepan, which may be employed with all safety. In other words, he advises cutting a hole in the skull with a drill if you can’t entice the insect out. This does not seem a terribly good idea. He, however, would recommend first to try such things as have been observed to be most effectual to disturb those troublesome guests, such as oil, the juices of some acrid plants, &c.
Much more sensible. The second case is, in some ways, still more unusual, given the apparent diet of the creature discovered. M. Maloet reported that one of the King’s household troops complained for three years of an acute pain in the left frontal sinus, which extended to the eye of the same side, so as to endanger his losing it. He had also a buzzing noise in his ear, to relieve which, he had some oil of sweet almonds put into it, and in two days after, he perceived in his left nostril an itching and stinging, as if something moved there, which he could not discharge, but by putting his finger into his nose, when behold he pulled out a worm, which ran swiftly on the palm of his hand, though covered with a viscous matter and snuff, of which this gentleman took plenty. This worm was put into a tobacco-box with snuff in it, where it lived five or six days. All the patient’s complaints ceased after this worm came away. The only difference between this and the former is this. This worm was six lines only long, and had but one hundred feet. But there was this singular in both cases. The former was thought to be expelled by the use of tobacco-snuff, whereas this subsisted three years with a plentiful use of the same weed, and after its expulsion, lived five or six days on the same. A snuff-eating sinus centipede, you say? Now I’ve heard it all. I thank God I live in an age of modern medicine, but how gross is it that we can still be affected by such crazy, random events? Off to Roto-Rooter my sinus cavity with BLEACH! People still use tobacco to kill many infection such as GI worms. Many become addicted to chewing tobacco as young as 2 or 3 because of this common treatment used by the poor. A tobacco addiction beats a slow, young death from malnutrition. Valid points. I have no issue with using natural medicines to treat afflictions or ease suffering, but the idea that a worm could be incubating in an airborne particle that I inhale and have it hatch in my head STILL gives me the willies!